Menulog delivers for Ogalo - Marrickville so you'll be able to track your courier on a map. 1 x Quarter Chicken, 1 x Small Chips and 1 x Can of Soft Drink. 1 x Quarter Chicken, 1 x Small Salad and 1 x Can of Soft Drink. 2 x Chicken Fillets, 1 x Small Salad and 1 x Can of Soft Drink. 1 x Half Chicken, 1 x Medium Chips and 1 x 600ml of Soft Drink. 1 x Whole Chicken, 1 x Large Salad, 1 x Large Chips and 1 x 1.25L of Soft Drink. Chicken, cheese, lettuce and mayo. Fish, lettuce and garlic mayo sauce. Veggie patty, cheese, lettuce, tomato, onions and mayo. Chicken, lettuce, cheese and mayo. Chicken, lettuce, cheese and chilli mayo. With chips and a can. Chicken, cheese, lettuce, pineapple, bacon and mayo. Chicken, cheese, lettuce, tomato, mayo and avocado. 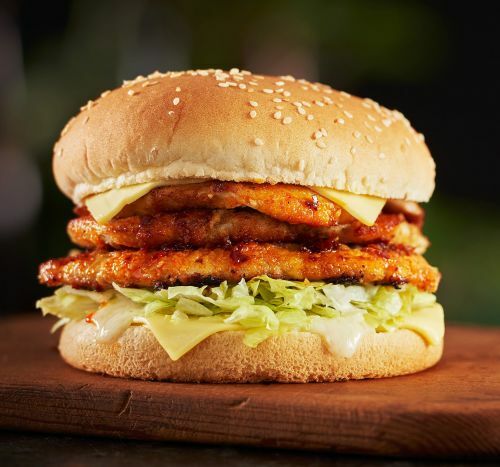 Chicken, cheese, lettuce, tomato, onion and our special Prego sauce. Extra chicken, lettuce, extra cheese and mayo. With chips and a can. Extra chicken, lettuce, extra cheese and chilli mayo. With small chips and a drink. Lettuce, mayo, shredded cheese, tomato and grilled chicken breast fillet. Lettuce, mayo, shredded cheese, tomato and grilled chicken breast fillet with chilli. Lettuce, mayo, shredded cheese, tomato, veggie patty and grilled onions. Lettuce, our special garlic mayo sauce and fish fillet. Lettuce, avocado, tomato, shredded cheese and grilled chicken breast fillet. Mayo, tabouli and shredded chicken breast fillet. Caesar salad, Caesar dressing and grilled chicken breast fillet. Chicken, lettuce, cheese and chilli mayo. Chicken, lettuce, tomato, grilled onions with a special Prego sauce. Extra chicken, lettuce, extra cheese and mayo. Extra chicken, lettuce, extra cheese and chilli mayo. Chicken, lettuce and mayo on long roll. Lettuce, mayo, shredded cheese, tomato and grilled chilli chicken breast fillet. Lettuce, shredded cheese, tomato, our special prego sauce, grilled onions and grilled chicken breast fillet. With lemon herb or chilli sauce. Meal comes with chips and drink.